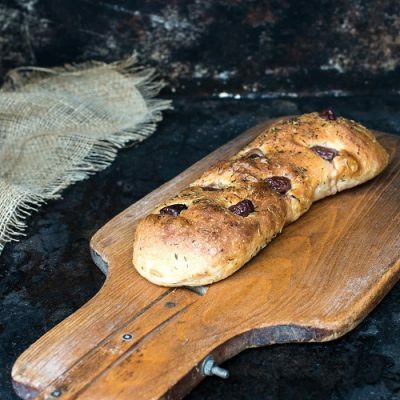 The delightfully moreish Kalamata olives make this tasty focaccia bread even better, creating a fantastic accompaniment to a Mediterranean lunch or dinner. The dark purple olives have a meaty texture that is perfect for dipping in rich tomato ragu or even presented as a starter before a traditional Italian or Greek dish. Fortified Wheat Flour (Wheat Flour, Iron, Niacin, Thiamin, Calcium Carbonate), Water, Olives (2%) (Pitted Olives, Sunflower Oil, Extra Virgin Olive Oil), Extra Virgin Olive Oil, Salt, Yeast, Rye Flour, Rosemary, Oregano, Acidifier: Acetic Acid, Ascorbic Acid; Roasted Malted Wheat Flour.